Can childhood neglect affect your sensitivity levels as an adult? Answer: Childhood neglect can have a profound effect on your emotional energy. Often it makes you very sensitive and open to your environment, sometimes too much so. Then it might seem that you “over-react” but really your empathy has been finely tuned by the trauma. 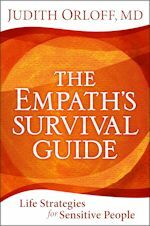 Use some of the shielding and grounding techniques I prescribe for empaths in The Empath’s Survival Guide. I find most sensitive people need to spend time in nature. I recommend that you regularly take time out from your routine. Visit the beach, a forest, a canyon, a river. Choose a spot that moves you. Aboriginals seek out windswept plains for purification. Native Americans go to fresh streams to clarify their inner vision. (Any water source, including a bath or shower, can cleanse and purify.) Tibetan monks pilgrimage to mountaintops. Allow yourself to draw on the earth’s primordial forces. Savor the beauty of a twilight, sunset, or dawn. Let them nourish and restore you. Also I’m a big believer in surrogate parenting. If you didn’t get the nurturing from your parents, find adults in your current life who can love and nurture you as parents would.